Who Do Deacons Need to Be? What Do Deacons Need to Know? What Do Deacons Need to Do? These three questions form the basis for Exemplars: Deacons as Servant and Spiritual Leaders. They are designed to encourage robust conversation within diaconates as well as between deacons, clergy, and other laity. All of us grow spiritually as we listen and speak to one another with open minds and loving hearts. For deacons to reach their full potential as spiritual leaders, thoughtful and prayerful conversation must happen. This workbook was born from years of pastoral experience and a growing conviction that congregational renewal must include lay renewal. Nearly every Baptist church has a diaconate, so it seems reasonable that if lay renewal is to happen, it must include deacon renewal. 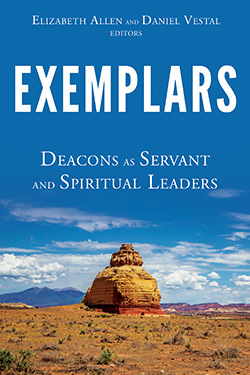 Exemplars can be helpful as a study guide for an individual deacon or in a small group or retreat setting where deacons study together, hold one another accountable, and offer support for one another as they seek to be exemplars of Christ and servants of Christ’s church. Written by veteran pastors and church leaders Guy Sayles, Michael Smith, and Carol Younger. Elizabeth (Libby) Allen is the administrative coordinator for the Eula Mae and John Baugh Center for Baptist Leadership at Mercer University. She served for 17 years with Admissions for McAfee School of Theology, Mercer University, and was ordained as a deacon in 1986. Libby has also served on boards for Baptist News Global and Passport, Inc. She lives in Atlanta with her husband, Loyd Allen. Daniel Vestal is the director of the Eula Mae and John Baugh Center for Baptist Leadership and the Distinguished University Professor of Baptist Leadership at Mercer University. He has served as a pastor and in leadership with a number of denominational, ecumenical, and institutional organizations. From 1996 to 2012 he was executive coordinator of the Cooperative Baptist Fellowship. 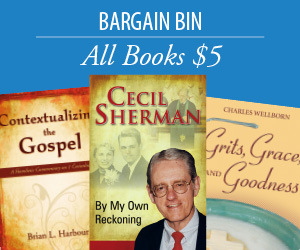 He is the author of five books, including Being the Presence of Christ: A Vision for Transformation. Daniel and his wife, Earlene, live in Atlanta.